How Close Is Close? In the expanse of space, the term "close approach" is relative. The closest spacecraft pass by Pluto before New Horizons was NASA's Voyager 1, which came within 983 million miles (1.58 billion kilometers) of the dwarf planet on Jan. 29, 1986. That's still 10.5757 astronomical units, or more than 10½ times the distance between the Earth and Sun! NASA’s New Horizons mission reached a special milestone today on its way to reconnoiter the Pluto system, coming closer to Pluto than any other spacecraft. It’s taken New Horizons 2,143 days of high-speed flight – covering more than a million kilometers per day for nearly six years—to break the closest-approach mark set by NASA’s Voyager 1 (pictured above) in January 1986. 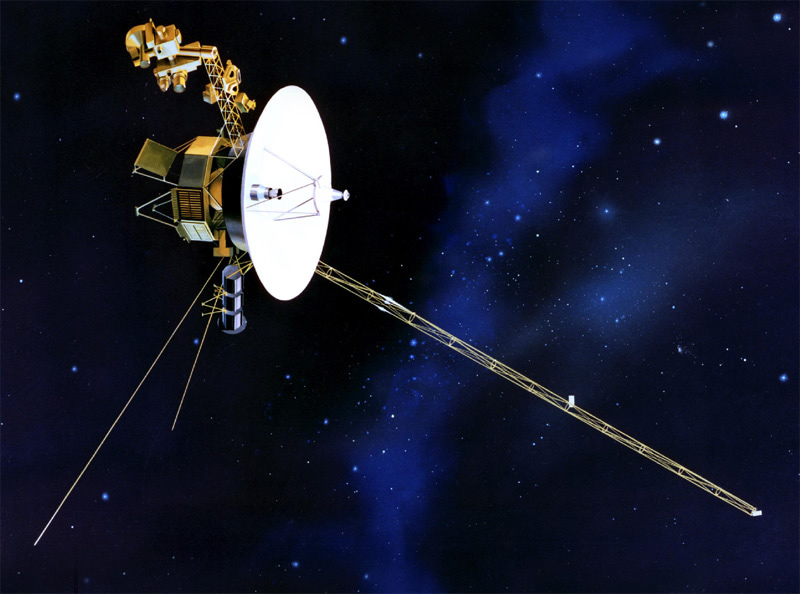 Pluto wasn’t on Voyager’s mission path, but after making historic flybys of Jupiter in 1979 and Saturn in 1980, the intrepid probe came about 983 million miles (1.58 billion kilometers) from Pluto as it raced to the solar system’s outskirts. 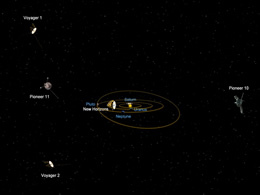 Now New Horizons, which is healthy, on course and closer to Pluto than Voyager ever came, will continue to set proximity-to-Pluto records every day until its closest approach – about 7,767 miles (12,500 kilometers) from the planet – on July 14, 2015. 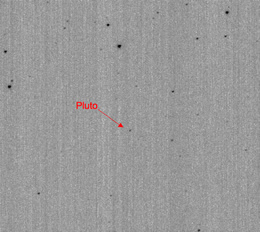 Pluto View (circa 2007): New Horizons’ current view of Pluto still resembles this image snapped by the spacecraft’s long-range telescopic camera four years ago; that will change exponentially beginning in late 2014, as New Horizons speeds closer and closer to its target planet and its cameras begin to resolve details. 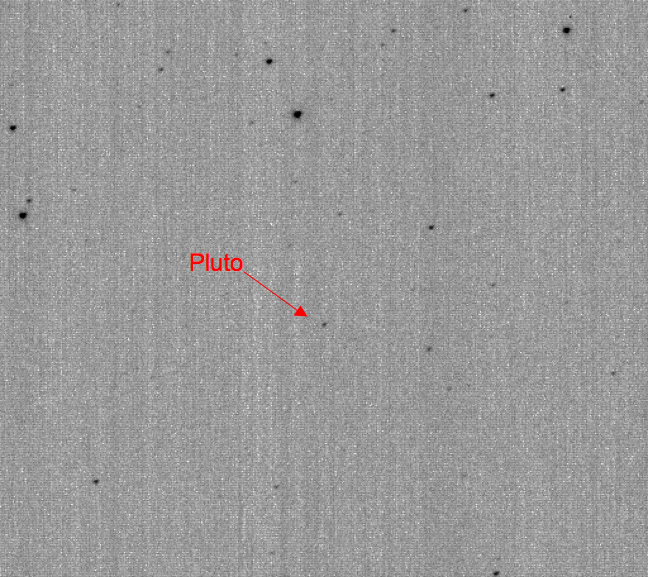 From New Horizons’ current distance to Pluto – as far as Earth is (on average) from Saturn – Pluto remains just a faint point of light. But by the time New Horizons sails through the Pluto system in mid-2015, the planet and its moons will be so close that the spacecraft’s cameras will spot features as small as a football field. “What a cool milestone!” says New Horizons Principal Investigator Alan Stern, of the Southwest Research Institute. “Although we’re still a long way — 1.5 billion kilometers from Pluto — we’re now in new territory as the closest any spacecraft has ever gotten to Pluto, and getting closer every day by over a million kilometers. Rare Space: New Horizons is just the fifth probe, after Pioneers 10 – 11 and Voyagers 1 – 2, to traverse interplanetary space so far from the Sun. And it's the first to travel so far to reach a new planet for exploration. Pluto is 3.1 billion miles (5 billion kilometers) from Earth. New Horizons is currently in hibernation, with all but its most essential systems turned off, speeding away from the Sun at more than 34,500 miles (55,500 kilometers) per hour. Operators at the Applied Physics Lab will “wake” the spacecraft in January for a month of testing and maintenance activities. Follow New Horizons on its voyage to the Kuiper Belt and beyond.